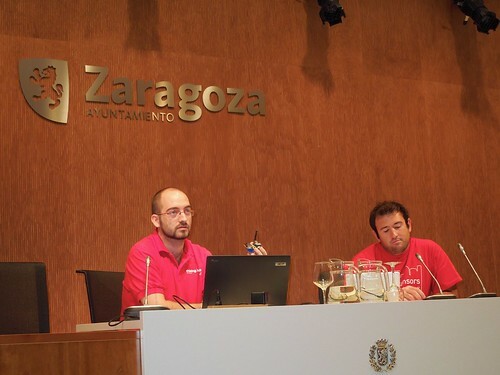 From 5 p.m. to 8 p.m. there were several lectures from experts in Arduino areas. Néstor Lizalde showed us how to integrate Arduino in Digital Art through his audiovisual projects. Jose Manuel Ruiz Gutierrez talked about Graphical Tools for Arduino Programming like Scratch, Ardubloq, Ardulab... in order to close Arduino to the education. 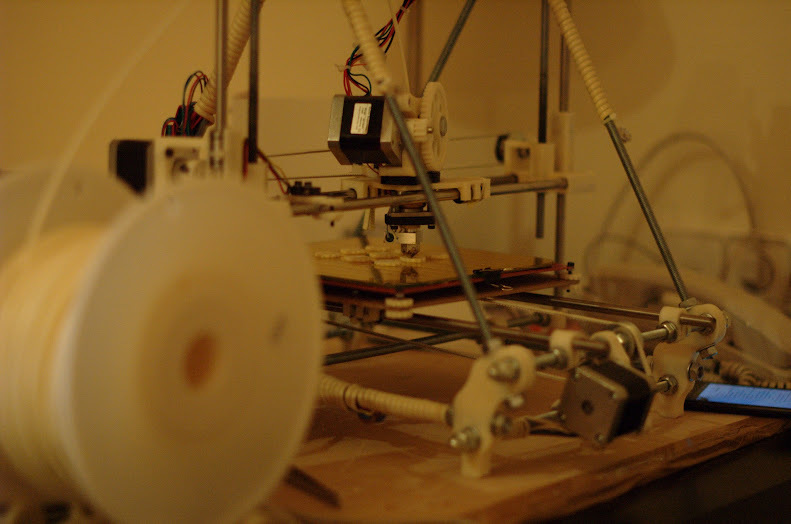 Finally, Clone Wars' group showed us their 3D printers (RepRap based) and talked about their philosophy about how to help community to create your own 3D printer. Finally, the Saturday came to Zaragoza. 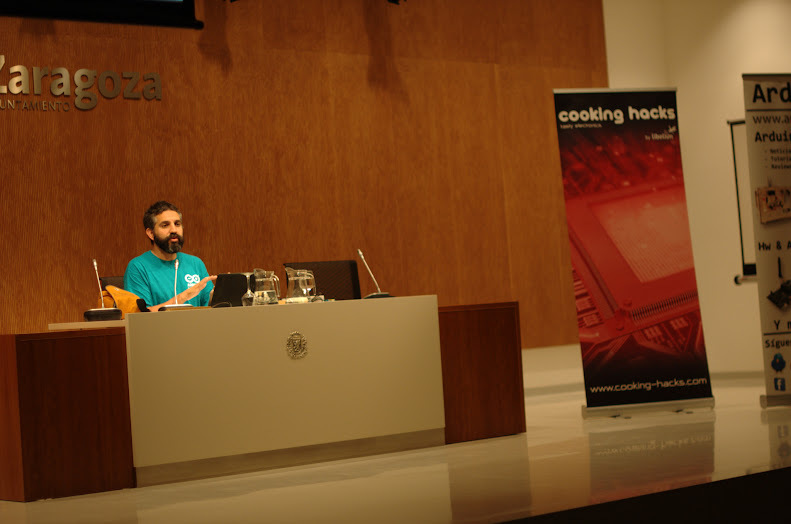 The event started at 10 a.m. with a Wireless exhibition by Marcos Yarza and David Bordonada from Cooking Hacks. They showed the latest releases like 3G/GPS Shield, RFID/NFC, Bluetooth PRO and Waspmote Starter Kit with the DEMO software. At 11.45, David Cuartielles from Arduino Team talked about the future releases by Arduino like the expected Arduino DUE with ARM processor. The morning ended with Carlos Monreal, from CADesigns, and his 3D printer and news about 3D printer world. After lunch, @baltolkien talked about PlasmaActive, a KDE-based tablet pc. After that, Jorge Montero made a great exhibition of integrating Arduino and Asterisk to create an active PBX to control each extension with Arduino. At 6 p.m., UltraLab (thank you for the 3D logo!!!) talked about Open Hardware and creative environments. 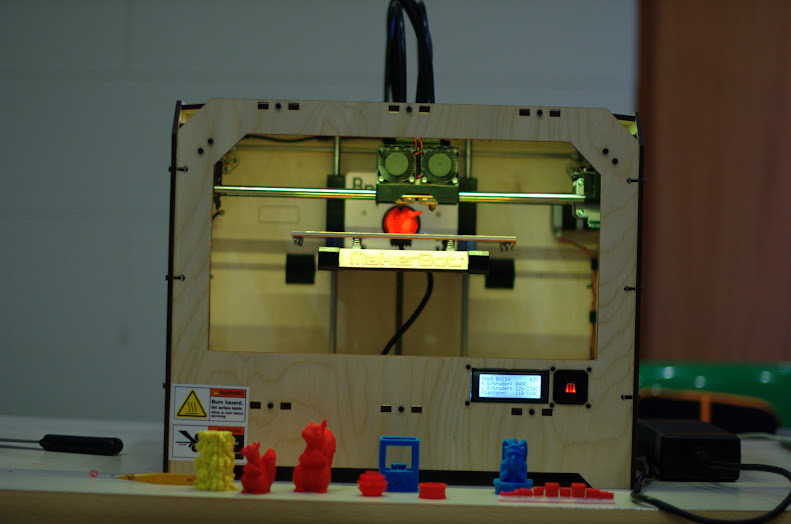 In their stand, they showed the new Makerbot's Replicator, Botanicalls and Littlebits kits, three great open source and creative examples. To finish the event, Complubot's team talked about Educative Robotic with the show of Robot Arduino (alpha project), a nice Arduino-based robot to teach electronics. Thank you for the exhibition! Thank you to all attendants. See you in the next event!! Important Note: Along the event, Cooking Hacks cooked some Conductive Dough for children. The recipe and pics will be posted soon. Stay tuned! !